SHS Bigs in School is here again in this 2014-2015 school year. Every Friday morning (if there is school that day) from 7:00 a.m. to 8:00 a.m. they meet at the Sabetha Middle School. From here, Sabetha High School Students are then matched up with kindergarten through 8th grade students. These matches will meet on a one-on-one basis and will do different things such as work on homework, play board games, and other things that could help the students. Staff of BBBS will walk with the grade school students to school after this, unless there are poor weather conditions. If there are poor weather conditions, a bus will be provided for transportation. At any point in time, a student can apply for Bigs in School by requesting a form from Mrs. Toedman, completing the form, and then turning it back into either the school office or Mrs. Toedman directly. You must be a sophomore and at least 15 years of age to be able to be involved in Bigs in School. All applicants must complete an application, 10-15 minute interview, and must pass background checks. 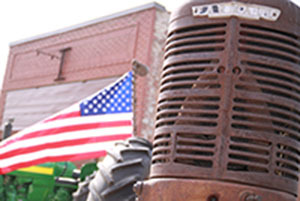 This photo was taken by the Sabetha Herald during the Big Brothers Big Sisters Tractor Cruise . 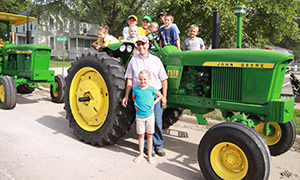 Picture of kids enjoying the Tractors during the Tractor Cruise taken by Sabetha Herald. 4. Be positive at all times!